Tour of Middlebury College's wood biomass gasification heating plant. We will leave at 1:00 PM and return around dinner time. This facility heats a campus similar in size to Dartmouth using wood chips. 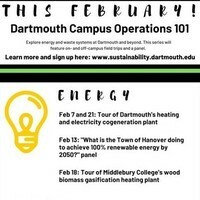 Dartmouth recently announced that we will transition to a wood biomass-based heating system in the next several years. Middlebury's facility is one example of what our energy system could look like in the next several years! Sign up here to attend!